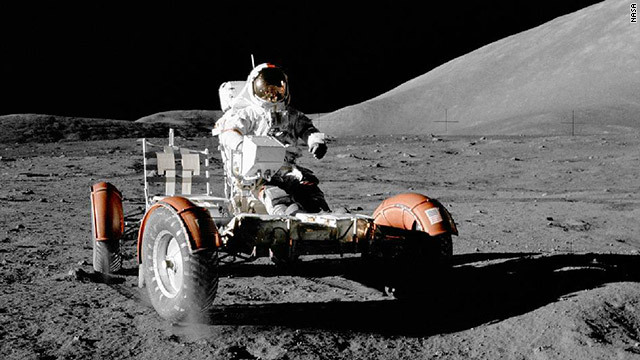 "Forty years ago today on Dec. 11, 1972, astronaut Eugene A. Cernan, commander, makes a short checkout of the lunar rover during the early part of the first Apollo 17 extravehicular activity at the Taurus-Littrow landing site. This view of the 'stripped down' rover is prior to loading up. Equipment later loaded onto the rover included the ground-controlled television assembly, the lunar communications relay unit, hi-gain antenna, low-gain antenna, aft tool pallet, lunar tools and scientific gear. This photograph was taken by scientist-astronaut Harrison H. Schmitt, lunar module pilot. The mountain in the right background is the east end of South Massif. While astronauts Cernan and Schmitt descended in the Lunar Module 'Challenger' to explore the moon, astronaut Ronald E. Evans, command module pilot, remained with the Command and Service Modules 'America' in lunar orbit." Vic; While a common belief, the moon is not always lit on one side. It rotates about the earth with the same side facing earth at all times. this means it has day and night just as we do. However, The sunlight falling on the moon is not filtered and thinned by atmosphere and solar collectors there do work well in the day. Weather does not block them as it does here on earth. A large portion of lunar equipment has been solar powered. Half of the moon is "all-day" and the other half is "all-night." I always wondered if it is possible to build a 'solar power' generation facility on the "all-day" half for whatever applicable usage out there!